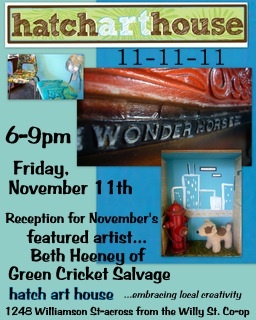 In the month of November we are celebrating the work of Beth Heeney of Green Cricket Salvage. Beth describes herself as part artist, part collector & part treasure hunter. Inspired by found objects and the world around her, Beth takes what others have discarded and transforms them into functional and unique treasures for your home. Beth puts her own spin on being ‘green’ and finds joy in breathing life into her vintage finds. Stop in from 6-9pm Friday, November 11th… refreshments will be served!